The most commonly sold U.S Olive Oils are designated as U.S Extra Virgin, U.S. Virgin and U.S. Olive Oil. Here’s a quick summary of each designation. These designations are set for both U.S. manufactured oils and the inspection of imported oils. A bottle of oil labeled simply “Olive Oil” is a blend of both heat-extracted and virgin olive oils. This oil will contain fewer defects than the virgin grade oils, but will also contain less flavor than the virgin oils because of the heat process used to make the oil. This oil has been pressed from fresh olives without the use of any heat or chemicals. There are almost no defects in this oil. When speaking olive oils, this is the highest quality available. A panel of taste testers have rated the flavor and aroma of this oil as “excellent” in order for it to carry the “extra-virgin” label. Olive oils are graded using the International Olive Oil Council standards. The International Olive Council (IOC) is a United Nations-chartered organization that has been recognized for more than 50 years as the worldwide quality-standard setting body for the olive oil industry. According to the IOC, both virgin and extra virgin olive oils are extracted by using only mechanical methods (no heat or solvents are allowed). After the oil is extracted, it is graded. If the olive oil is found to be fruity, has no defects and has a free acidity that is less than or equal to 0.8 , it is graded as extra-virgin. Note: Other oils, for instance avocado and coconut oils, that carry an extra-virgin label should adhere to the same standards for extra-virgin and also be considered natural oils as they are not put through a chemical extraction process. Now that we’ve explored the two main types of olive oil, plain old olive oil and top of the line extra-virgin olive oil, let’s take a look at what else is out there in the middle. Virgin olive oil is also considered a natural oil as there are no chemicals involved in the process of making the oil, but it is not as perfect as extra-virgin olive oil. Olive oils with minimal defects (keep reading) and a free acidy between 0.8 and 2.0 are rated as “good” by the experts and graded as virgin. Both extra virgin olive oil and virgin olive oil have the same amount of antioxidants and are tested to ensure purity. There are actually quite a few things that can happen to olives while waiting to be pressed. Here is a list of the most common things that can go wrong with olives and/or olive oil, especially those within this category. Fustiness – this refers to fermentation without oxygen. This can happen when the olives sit too long in large piles before being processed. If it happens, the resulting oil may smell like an old barn. Mustiness – refers to a moldy flavor. Mustiness will occur if olives get wet and then begin to grow mold before being processed into oil. Frozen – this defect occurs if olives have been hit by a frost prior to processing. The frozen oil flavor has been compared to green apples or mushrooms. Rancidity – happens when the fats in the oil begin to break down. This begins to happen as the oil ages and becomes noticeable after its eat by date. Rancid oil will smell like paint thinner. This is why oil is best stored in a cool dark place, starting immediately after production. Winey – this flavor can happen after prolonged exposure to oxygen. This is why oils should always be kept well sealed. The resulting oil will smell sour like vinegar, and probably taste like vinegar too. Virgin olive oil is not pictured here because it is actually no longer sold in retail stores in North America. 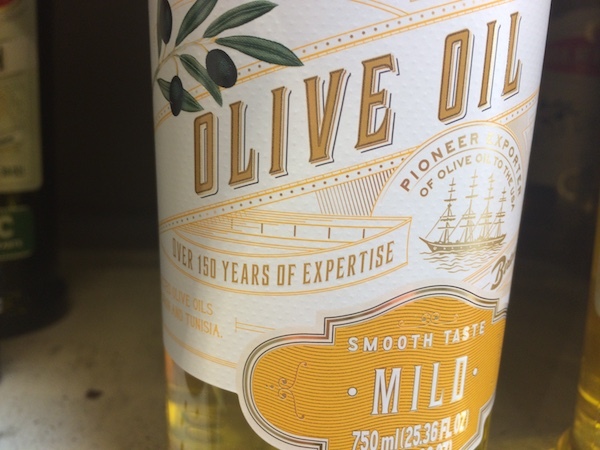 The next category of light olive oil is now taking up more and more shelf space in the stores. Now, what is “light” olive oil, “extra light” olive oil and/or “light extra virgin olive oil”? The answer is not the expected “fewer calories” than regular, or even “less fat” than regular. The only thing lighter about this oil is the taste. 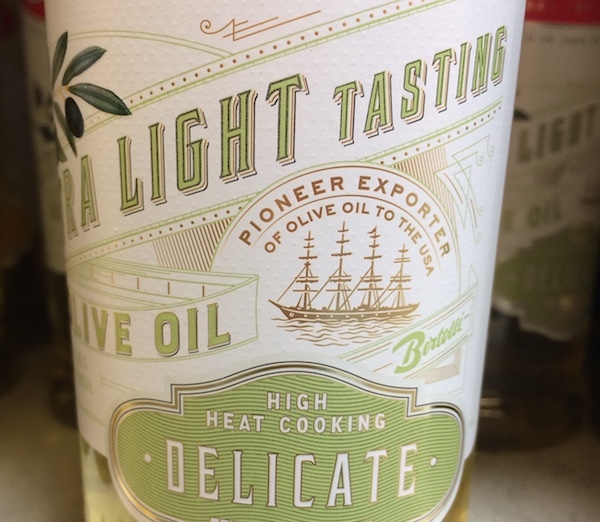 The bottle pictured above is at least labeled correctly as “extra light tasting”, but most bottles will leave off the word “tasting” and just call it “light olive oil”. Olive oils labeled “light” are a combination of refined olive oil and extra-virgin olive oil. These otherwise worthless oils are refined with solvents, deodorizers, and/or charcoal before being lightly flavored with extra virgin olive oils to hide any strange tastes that were acquired during the refining process. Advantages: This oil tastes blander than other olive oils and thus can be used for baking without changing the taste of the baked goods. It also has a higher smoke point, making it acceptable for frying. Other olive oils without the “light” distinction are not generally recommended for baking and/or frying. 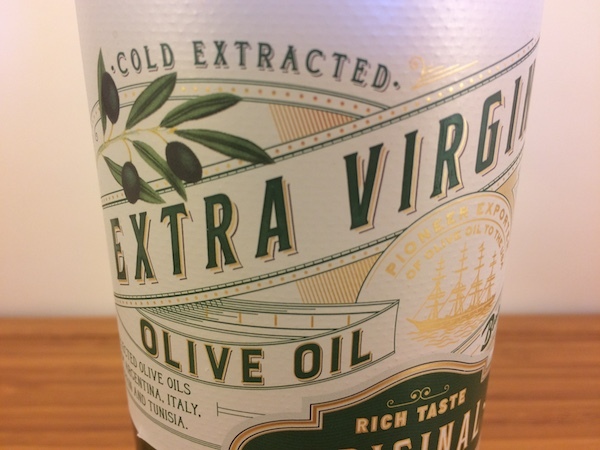 Disadvantages: If you want to use olive oil for its health benefits, don’t even give a thought to extra light, light, or really any olive oil that isn’t labeled “extra virgin”. Beware, as always, that labels are printed by the manufacturer and can be misleading. For the freshest and best tasting oils, consider those that print the actual grove name where the olives were grown right on the label. This way, you know where the olives came from. To find out how long oils last and the best storage options, check our oil page.